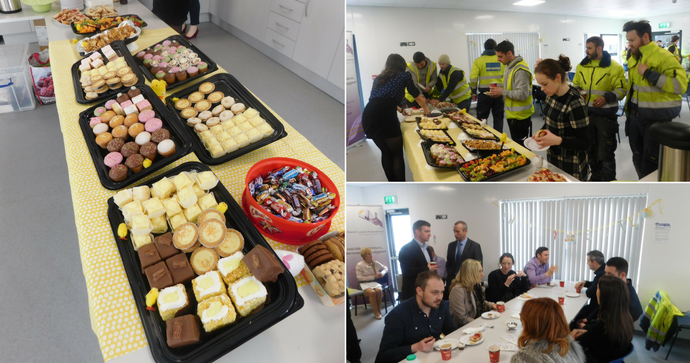 The McAvoy Group have again continued to support local charities, by running a special Easter Coffee Morning. The Health and Wellbeing Committee within McAvoy successfully ran the event on Thursday 29th March. McAvoy depots in Dungannon and Lisburn both got involved, and supported charities locally to each location. Head office in Dungannon supported The Níamh Louise Foundation, a great local charity who work with a range of voluntary and statutory agencies to help reduce suicide rates in Northern Ireland. Their work includes suicide awareness, prevention, intervention and postvention services to the community. The McAvoy plant in Lisburn supported Stepping Stones NI, who have been providing training to people with a learning disability for over 20 years, to allow them to have greater opportunities for employment. They have grown considerably since 1996, with services now beyond Lisburn including Greater Belfast, Downpatrick, Newtownards and surrounding areas. The combined total from both plants was £723.43, and is to be split equally between both charities. McAvoy will continue to support charities in 2018, with exciting plans currently in development.